One of my favorite aspects of Postcrossing is learning about people, places, foods, folklore and other things that I had never heard of before. This beautiful postcard came to me from Stella, one of 34 million residents in the metropolitan region of Shanghai, China, and it shows one of the villages belonging to the Hani people, an ethnic group that numbers fewer than 800,000 worldwide (most of them being in southern China). 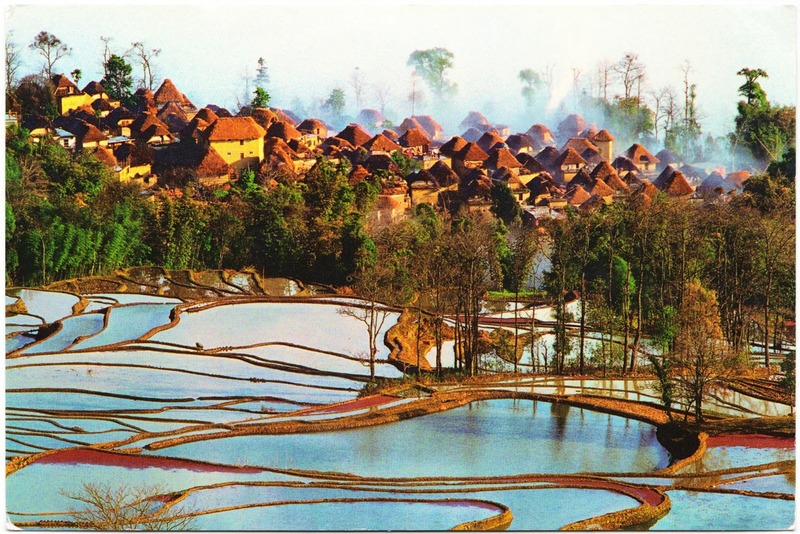 The Hani people, who have their own language and a cultural history that dates back more than 1,200 years, practice terraced rice cultivation, which is what we can see in the foreground of this postcard. The back of this postcard describes the site as the "Qingkou Hani Ecological Village," but I could only find one Google reference for that specific site name. The more common name for the location appears to be "Qingkou Hani ethnic village." It is located 6 kilometers south of a town called Xinjie in Yuanyang County, Honghe Prefecture, Yunnan province, China. "Qingkou is a typical Hani Village, which consists of 150 families and has a population of 800 of Hani ethnic minority. This Hani village is mainly presents the common characteristics of the Hani Terraced Fields culture. It maintain an integrated ecosystem among the forest, water system, villages and terraced field. ... The village is shrouded in luxuriant forests where you can here the humming birds and cicadas in summer and experience the primitiveness. Walking around the village along the stone path, you can see the change of time as well as the local unchanged life on magnificent terrace fields. The earth-made houses on the both side of path are well ranked, whose housetop looks like a big mushroom. These houses are called mushroom houses, which are the traditional residences of Hani people. They are comprised of earth-made walls, bamboo or wood frameworks and straw housetops." A spring named called Bai Long Quan (White Dragon Spring) serves as the main water resource for Qingkou, according to Top China Travel. The site also further describes the "mushroom" houses: "The special structure of it make the inside warm in the winter and cool in the summer. The roof of this house will be designed into 4 slopes. Each floor of this house may have its unique function. The 1st floor will be used for housing cattle and horses. The middle floor is designed for fire prevention measure. And during the harvest season, the roof can use for drying food." To learn more about the Hani people (and the related Akha people), especially from official academic research, this page on Ethnic China is a great jumping-off point. "Cradle Roll Class of a One Room Sunday School"